can do in Mexico are the following: fishing, adventure racing, triathlon, triathlon road, marathons, diving, cycling, swimming, extreme flight, nautical tourism and surfing. Skydiving: if you want to feel full freedom, what better way to do that skydiving! taking advantage of the updrafts of warm air that hit the mountains to look unique and unimaginable landscapes, several meters high, which undoubtedly will give you a different perspective on life. Mountaineering: In Mexico find true giants of rock and ice, with unexplored peaks waiting to be conquered. Such is the variety of sites and areas for this sport, that even you can afford to explore new routes in unfamiliar elevations, reaching peaks where you can contemplate the valleys and mountains that line with great beauty geography. Furthermore, most of the places where this sport is practiced has spaces which athletes and walkers can exercise, fresh air and exceed their goals. The wide expanse of beaches allows us also to have many spaces for surfing, so many places in the Pacific and Caribbean often receive visitors from both Mexico and elsewhere. It is usually at dawn when the best waves, which can reach a height of 8 m extreme speeds, which are an interesting challenge for even the most experienced surfers rise. 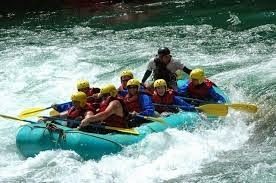 In the states of Morelos, Veracruz, San Luis Potosi and Chiapas The brave and mighty rivers of waters become an insurmountable for those who like streams on rafts descent stage. Quick to all kinds of people there, from the easiest for beginners as well as difficult challenges even for those with experience, since it is possible to find common class I and class VI to. Browse downstream is a different way to enjoy nature: you enjoy meandering places, you face falling waterfalls, feel how shallow water full force, dodging branches and see you surrounded by jungle vegetation converts rafting on experience very exciting. Sports tourism in Mexico offers a wide range of activities: skydiving, bungee, surfing, climbing, motocross, diving, paragliding ... we want to know what extreme sports practice or would like to learn more about any specific, to tell you more in future articles detail about them, and let you know the best places where you can practice.